"If you want to survive, follow me." It's time to get a first look at the next new sci-fi young adult adaptation - Divergent, based on Veronica Roth's book of the same name, starring Shailene Woodley as Tris. Set in a dystopian future, society is divided into factions based on personalities, but Tris is one of the few "Divergents", someone who acts on their own independent will and can't be controlled. This footage has a bit of a Hunger Games tone, but still has potential to be entertaining in its own way. Theo James co-stars, along with Kate Winslet and Maggie Q. Give it a watch, at least for Shailene. "Don't try and define me." 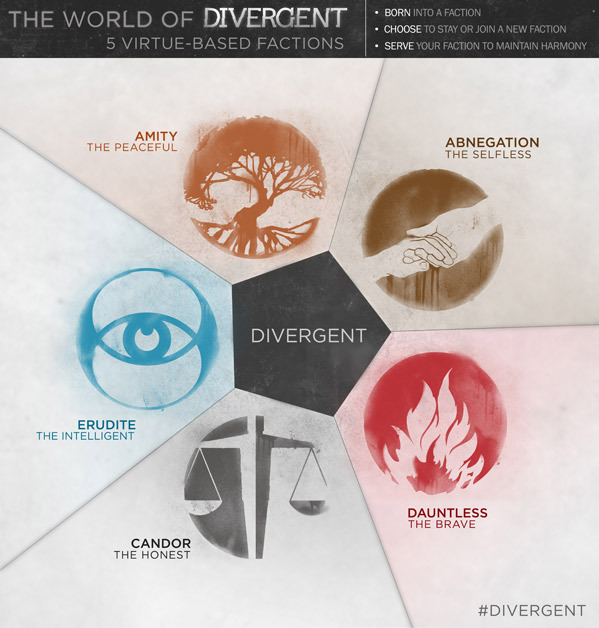 Summit provided the above infographic to help explain the five different factions in the Divergent universe. Actually got a feel of Equilibrium from that for some reason, in a good way. Equilibrium is actualy one of the best scifi movies and this looks like just another teen flick. I would not associate such greatness with stuff like this. It was more the feel of the movie, Equilibrium was obviously constrained a bit with the budget, but still managed to deliver a good film. Ummm... what...? It's a very good movie, yet, you haven't seen it...? Probably meant very good trailer. I was about to say "too many dystopian future sci fi's"... but.... NAAAAAHH!!! Looks neat. Haven't read the book, so this might very well have a legit answer, but why is everyone split up by personality? What's the point? From just this trailer it makes about as much sense as a dystopian future where everyone is split into hotdog lovers versus hamburger lovers, and any pizza lovers are killed. Sure, it's something to base a book/movie off of I guess, but it doesn't seem to have any logical motive. Surprised I didn't hate this. From just this trailer it makes about as much sense. I watched a good MV lead designer and its amazingly. I love music and some of the deeper level thinking that went into tunes.